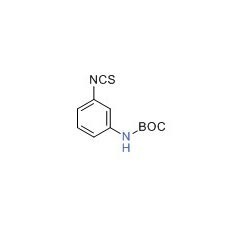 We are a renowned manufacturer, exporter and supplier of tert-Butyl N-3-Isothiocyanatophenyl carbonate. It is processed using the best grade ingredients utilizing advanced technology under the directions of our experienced professionals. The quality controllers working with us inspect the entire range to maintain international quality standards. We also make available this product in customized options in order to meet the specific requirements of our esteemed clients.